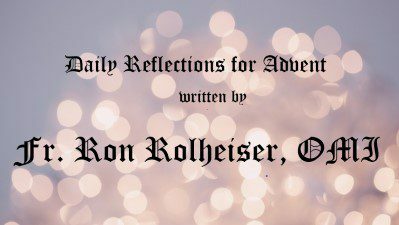 Each day of Advent beginning December 1, and going through December 24, you can hear a new Advent Reflection written by Fr. Ron Rolheiser, OMI. Produced with music and professional voices, these 2 to 4 minute reflections will enhance your Advent experience and help you remember what the Advent and Christmas Seasons are truly about. These audio Advent Reflections run between 2 and 3 minutes each.